La Favorite has changed hands a few times since it opened back in 1985. It was put on the map as the cake shop to bake and ice Wayne Gretzsky's wedding cake, and has a special place in my heart, because they made my parent's wedding cake as well. Though I've tried almost everything on their cake menu over the years, we go back again and again for their raspberry white chocolate moouse cake. With one caveat - we only go to the main bakery on 95th street. We're not sure if its because of management changes, but over the years, we've learned to only go to the main store, as the location on High Street 12431 - 102 Avenue tends to be a crapshoot. The secondary location doesn't rotate out their cakes as often, so there's been several times where we were horribly disappointed with dry cracked glaze and powdery dry cake. 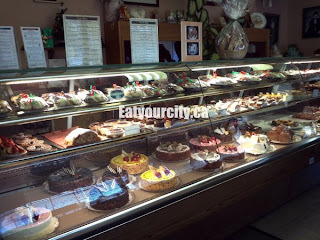 Despite letting management know a few times, things haven't changed, so, we only head to their head office on 95th street, tucked in a little run down neighbourhood for fresh cakes. Its a completely different world when you step through the doors. Gleaming display cases showcase delectable freshly made pastries and desserts (properly rotated), and the air is filled with the scent of sugar and chocolate. Mmmmm. Mmmmm. 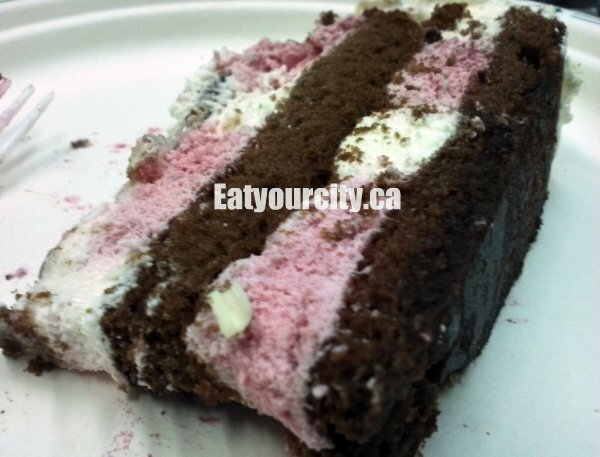 Moist layers of chocolate sponge cake laced with a touch of raspberry liquor, sandwiches layers of fluffy creamy lightly flavored raspberry moouse swirled with whipped cream. (See the interplay of the moouse and whipped cream in picture) Topped with a raspberry glaze, fresh strawberries, and a chunk of marscapone cream to support its signature ruffle of white chocolate, depending on the season it'll be topped with more fruit, more chocolate or as its the holiday season, a little wrapped chocolate in the shape of a present. The exterior of the cake is dirty iced in cream and covered up with white chocolate shavings. 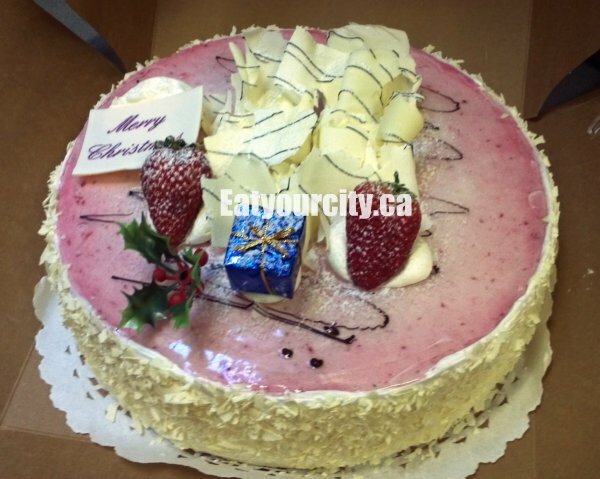 Its funny, as its a white chocolate raspberry moouse cake, in the last decade, they have never used raspberries for this cake to add on the top... only strawberries. Odd, but yummy in anycase.